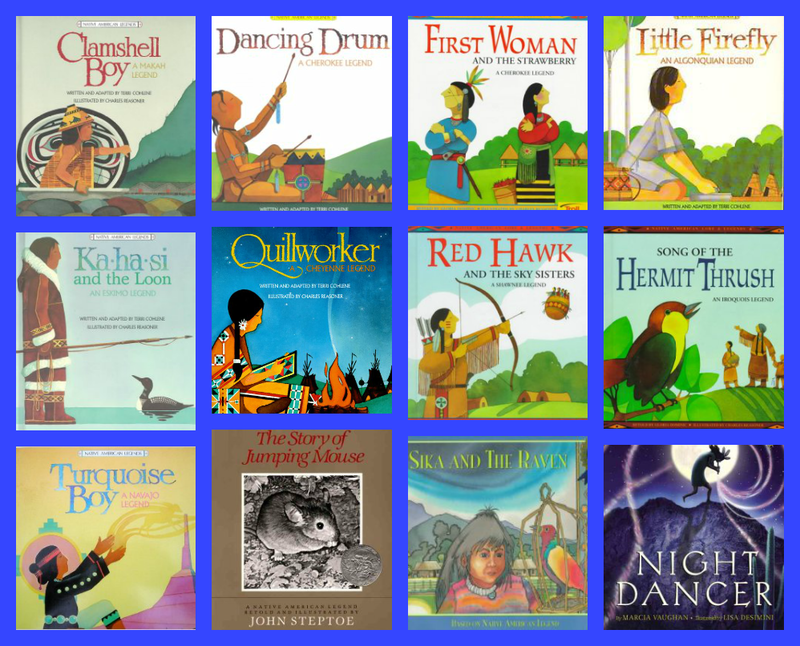 Today I thought I would share some Native American picture books and legends with you. Hazel and I have been enjoying reading them and I find it such a wonderful way to share the Native American culture with Hazel as well as learn more about it myself. Some of these books we have had a chance to read and others we have not yet. However I wanted to give you a pretty comprehensive list. Also below is the blog hop and giveaway with a newly added bonus prize!! Make sure you enter this week!! 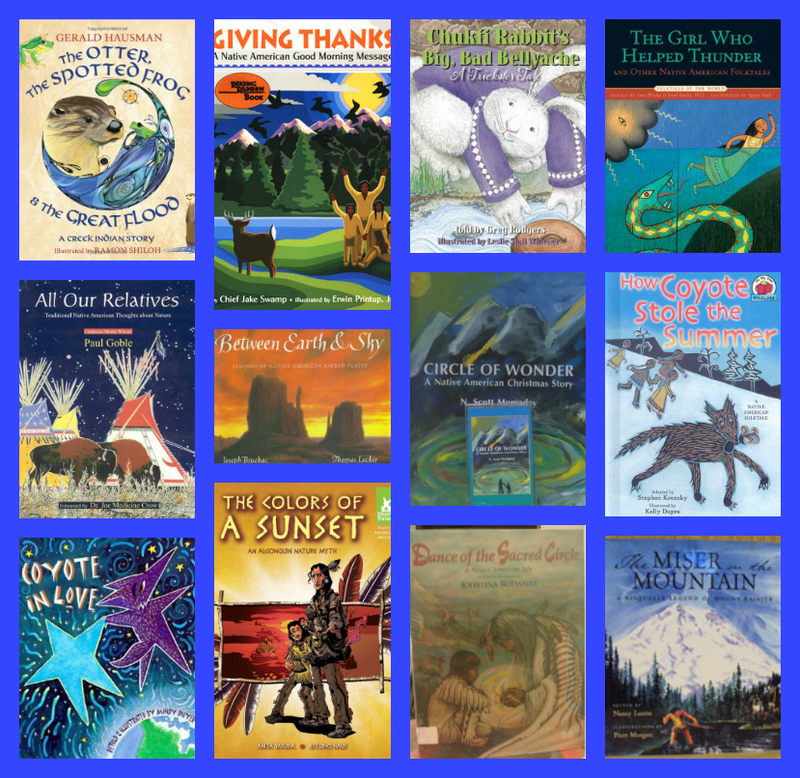 The Otter, the Spotted Frog & the Great Flood Retold by Gerald Hausman is one of the books being given away this month as part of the Multicultural Kid Blogs Native American Heritage Month Blog Hop and Giveaway. (You are able to enter the giveaway below!) Thank you to Wisdom Tale Press for providing it. It is a wonderful tale about animals and who listens and who does not to the warning of the great flood. Giving Thanks by Chief Jake Swamp is one of the books being given away this month as part of the Multicultural Kid Blogs Native American Heritage Month Blog Hop and Giveaway. (You are able to enter the giveaway below!) Thank you to Lee & Low Books for providing it! I reviewed this book at the beginning of the month to kick off the blog hop and giveaway. Chukfi Rabbit's Big, Bad Bellyache: A Trickster's Tale Told by Greg Rodgers is a legend about a rabbit who does not like to work and tells his friend he will help build her house just so he can eat the homemade butter. He says he is sick and goes to eat the butter while the other animals are not looking. In the end he learns a lesson. The Girl Who Helped the Thunder and Other Native American Stories Retold by James Bruchac and Joseph Bruchac we have not read yet. It is a collection of stories from different tribes. The book is divided by location in the United States. All Our Relatives: Traditional Native American Thoughts about Nature by Paul Goble we have not read yet. It is a collection of stories that share the olden days of pre-reservation time for the Lakota. Between Earth and Sky: Legends of Native American Sacred Places by Joseph Bruchac we have not read yet. It is a story of a boy who learns that everything in the world has its place and should be respected. Circle of Wonder: A Native American Christmas Story by N. Scott Momaday is a Christmas tale where a mute boy sees the figure of his dead grandfather join a circle with animals and nature for a moment of peace and goodwill. How Coyote Stole Summer Adapted by Stephen Krensky is a folktale about a time when it is always winter and coyote and his friends are always cold. Old woman however has a bag holding summer and coyote and his friends plan to steal it so everyone can enjoy some warmth. Coyote in Love Retold by Mindy Dwyer is a tale about coyote falling in love with a star. The result is Crater Lake in Oregon. The Colors of Sunset: an Algonquin Nature Myth Adapted by Anita Yasuda is a folktale about a little boy who wants the colors of the sunset. Dance of the Sacred Circle Adapted by Kristina Rodanas is a Blackfoot legend about a boy who looks for the Chief of the Sky to help his starving tribe. The boy is rewarded with the first horse. The Miser on the Mountain: a Nisqually Legend of Mount Rainier Retold by Nancy Luenn is a story about a man who climbs Mount Rainier for treasure and he learns that his treasure is not the most important thing in life. Moon Mother by Ed Young is a retelling of a Native American creation story. Musicians of the Sun by Gerald McDermott is a retelling of an Aztec myth about how the lord of the night sends wind to free his musicians from the sun so they can bring color and happiness to the world again. How Chipmunk Got Tiny Feet by Gerald Hausman is a collection of seven Native American stories that explain how animals got certain characteristics. Turtle Island ABC: A Gathering of Native American Symbols by Barry Moser is a book that defines traditional Native American symbols from A to Z. Rabbit's Wish for Snow by Tchin is a retelling of a Native American legend that explains why rabbits look the way they do. Race With Buffalo and Other Native American Stories for Young Readers by Richard Young is a collection of ancient tales gathered from all over the country. The Woman Who Lived with the Wolves and Other Stories from the Tipi by Paul Goble is a collection of 26 stories from different tribes. They Dance in the Sky by Ray A. Williamson and Jean Guard Monroe is a collection of star myths from various Native American tribes. D Is for Drum: A Native American Alphabet by Michael Shoulders and Debbie Shoulders is a book that goes from A to Z with various words found in Native American culture. They provide a definition for each word and teach about the culture. Path of the Quiet Elk: A Native American Alphabet Book by Virgina Stroud is a lyrical alphabet book that reminds us of our interconnectedness with everything on earth. 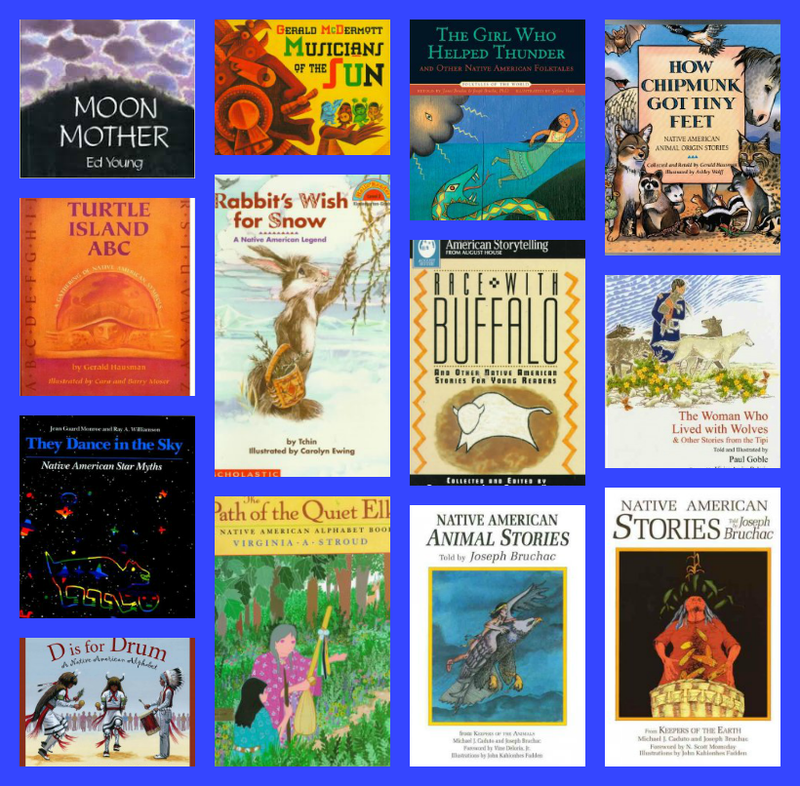 Native American Animal Stories by Joseph Bruchac is a collection of 24 Native American myths that demonstrate the powers of animals. Native American Stories by Joseph Bruchac is a collection of Native American myths with a common theme of family. Clamshell Boy: A Makah Legend by Teri Cohlene is a retelling of a myth where a wicked basket woman is stealing children to eat and clamshell boy tries to find a way to trick her. Dancing Drum: A Cherokee Legend by Teri Cohlene retells the tale of a young boy who tries to save his people from the wrath of the sun. First Woman and the Strawberry: A Cherokee Legend by Gloria Dominic retells the story of the argument between the first man and woman about how the strawberry was created. Little Firefly: An Algonquian Legend by Teri Cohlene is one of the Native American Cinderella tales. I posted about it previously. Ka-ah-si and the Loon: An Eskimo Legend by Teri Cohlene retells the tale of an idle sleepyhead saving his people from famine and disaster. Quillworker: A Cheyene Legend by Teri Cohlene retells the story of how the stars were born with the help of a young woman famous for her porcupine-quill embroidery. Red Hawk and the Sky Sisters: A Shawnee Legend by Gloria Dominic retells the story of a great hunter who sees the sky sisters and falls in love with the youngest one. Song of the Hermit Thrush: An Iroquois Legend by Gloria Dominic retells the story of how the thrush learned the beautiful song and the animals greet the day. Turquoise Boy: A Navajo Legend by Teri Cohlene retells the tale of a boy searching for something to make his people's lives easier. The Story of Jumping Mouse by John Steptoe retells the legend of how the gifts of the Magic Frog and the unselfish spirit of jumping mouse brings mouse to the faraway land where no mouse goes hungry. Sika and the Raven by Carl A. Hammerschlag retells the tale of how Sika learned she was not ready to have a child and the raven lost its colorful feathers and beautiful singing voice. Night Dancer by Marcia Vaughn is a lyrical poem featuring Kokopelli, the beloved humpbacked southwestern Native American god. 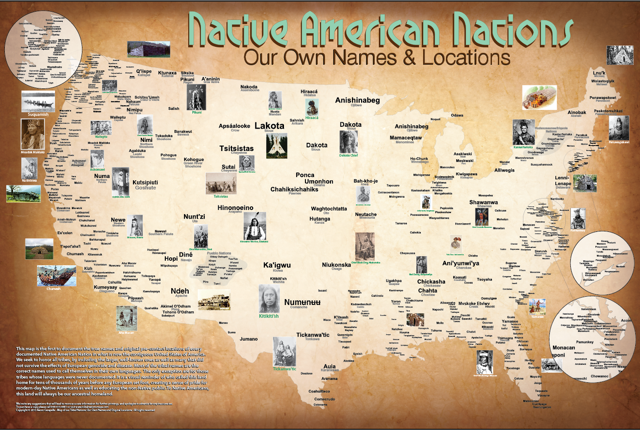 Later this week I will be doing a round-up of Native American biographies!